Most of us have a toner in our cupboards because it seems like something that skin care people are always touting as an important part of our routine but is it really? What does a facial toner actually do for us? Is it a necessary step in our routine? Let’s take a closer look at toners, how they’ve changed over time and what to look for when you’re making your choice. A toner is a hydrating skin care product that’s meant to shrink the look of large pores and further cleanse the skin, picking up any makeup or debris that may have been left behind. This is used after a cleanser but before a Serum or a Moisturizer. There’s a bit of controversy because skin toners have recently undergone a shift in their use. Toners were originally designed to help restore skin’s pH balance because old styles of cleansing (with soap bars and harsh cleansers) disrupted the pH of the skin’s acid mantle, leaving skin more vulnerable to bacteria and other microorganisms. While a lot of general cleansers can still negatively impact the skin’s pH overtime, most products that are designed as facial cleansers now aren’t as alkaline as they have been in the past. An ‘astringent’ is a product created solely for oily skin with large and clogged pores. Astringents often have alcohols in them or ingredients like salicylic acid or witch hazel and are geared towards tightening and removing excess oil from oily skin types—these products can strip the skin’s mantle and can actually unbalance the pH! Though they are often called ‘toners,’ these types of products are more of an additional treatment than a toner is so make sure to watch the ingredient lists when you’re choosing a new toner. Face toners are created to be catered toward all skin types. Every toner is a bit different and they can be focused on different types of issues depending on the ingredients but in general, this type of product is made to prep the skin after cleansing, like an extra primer step that gets the skin good and ready for the rest of your beauty routine. They’re gentle and hydrating and they give the skin a boost rather than removing something. We talked about this a little bit above, but you want to check out the ingredients in your toner. Of course we feel this way about every product you put on your skin, but a toner is the first thing that touches fresh skin. If you’re prepping your skin with ingredients that aren’t right for your skin, the rest of your routine won’t be as effective as you’d like it to be! It’s helpful for me to look at the larger picture so let’s think about the desert, there’s no water right? If you try to add nutrients or pour water on top of the cracked earth it’ll roll right off. It takes time and the proper care to turn a desert into an oasis and it’s the same thing with skin care. If you’re using ingredients like alcohol in your face toner, you might be accidentally creating a desert. Alcohol can cause dehydration that can lead to the appearance of aging—the opposite of what we want a toner to do for us. We want toners to hydrate the skin and give it the nutrients it needs so we can feel like we’re living in our own glorious oasis. The right toner has ingredients that create a number of benefits, giving you a quick and refreshing lift that helps restore and renew your skin. Look for ingredients like aloe vera or hyaluronic acid to increase hydration, hydrosols or other water-based infusions, and other plant-based ingredients that are targeted for your skin type. Think all that is too much to expect from your toners? It’s not. In fact, we have two stellar toners that perform all seven steps for you, and are also tailored to your skin type. 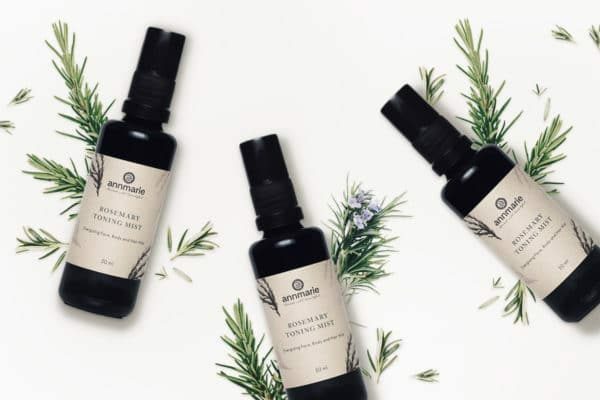 Our Rosemary Toning Mist is rosemary hydrosol with added ingredients like aloe vera for hydration and thyme and neem to help control excess oil production without being drying. Natural antioxidants like carnosic and rosmarinic acid protect from environmental stressors. Rosemary is even reputed to help brighten the skin and give it a firmer, more toned look. For those who like more floral, soothing toners, we recommend our Neroli Toning Mist. Neroli is an amazing ingredient on its own, with cleansing properties that help minimize the appearance of pores. It has a tightening effect that helps tired skin look livelier. Neroli's calming and soothing nature also makes it a wonderful facial toner for folks with sensitive skin! Meanwhile, the aloe vera juice provides antioxidant protection, vitamins and minerals, and moisturizing fatty acids and the aspen bark is a natural preservative. Is toner an important part of your skin care routine? Share your thoughts below! Rather than let the toner dry naturally I understand it is good practice to add you’re serum before the toner dries on your skin. The extra moisture I have heard will aid the serum in hydrating your skin. Is this true? Hi, Donna! We would agree that it is best to apply your serum and/or facial moisturizer on top of the toning mist while your skin is still damp. I have been using your products for about 6 weeks now, and the difference in my skin is amazing! I use the aloe herb cleanser (love it) then the Neroli Toning Mist (so light and fresh), the serum, and the minerals. I use the unscented facial oil at night, after cleansing and toning. Wonderful products! Do you perhaps have a suggestion about how to reduce nose shine? I have been brushing on a bit of the dry mineral, but still have some shine on my nose, after mixing the mineral with serum and using as a base. I started using toners for the first time a few years ago, and it took a while–and many questions to various natural skin care companies–to wrap my head around what they do and how to use them. Your article helps clarify even more, thank you! I use a toner every time I do my skin care routine (cleanse-tone-moisturize, or cleanse-exfoliate-tone-moisturize), and it has made all the difference. In the past, I just cleansed, and sometimes moisturized, and that was it — and I was always experiencing clogged pores. Once I started this more complete, balanced routine, though, the clogged pores went away. And, my skin is calm, smooth, soft, and glowing! After cleansing, I put on an old pair of skinny reading glasses to further protect my (very) sensitive eyes, and then I close my eyes and heavily mist my face, neck, and chest with toner to saturate my skin. Then with clean hands I gently press it completely into my skin. Then while my skin is still damp, I add my moisturizer and gently massage it into my skin until it’s fully absorbed. Then sometimes I lightly mist again with a final spritz of toner on top. I sometimes spritz with toner during the day, too, just to enjoy the fragrance and the cooling, refreshing feeling, and to help hydrate, of course. I do use toners that combine different elements such as aloe vera, essential oils, and hydrosols, but my favorite kind of toner to use is just pure plant hydrosol, such as rose, rosemary, rock rose, frankincense, clary sage, and patchouli hydrosols (I’ve tried a lot — too many to mention here!). The hydrosols I use are also good for hair, so I often spritz them into my hair when it’s wet, too. I use your toner, and it is a spray mist. Is it best to spray on and allow to dry on its own, or is there another better way to use it? Thank you. I’m happy to help! Could you let me know what you’re looking for in terms of ‘amounts?’ Thank you! Thanks for the information on toners. I haven’t used one in years, because I thought they were astringents like I used when young. This sounds like something I might like to add to my skin care routine. I love these blogs; they are well-written and always provide helpful information. After many years of investing in beauty products, I learn something new from the great tips from Annmarie. My skin looks and feels better when I use her products! Thank you!